Who doesn't love mayonnaise, at least a nice garlicy aioli with their BBQ or a dab of mayo on a sandwich or with some crudités or hard boiled eggs? 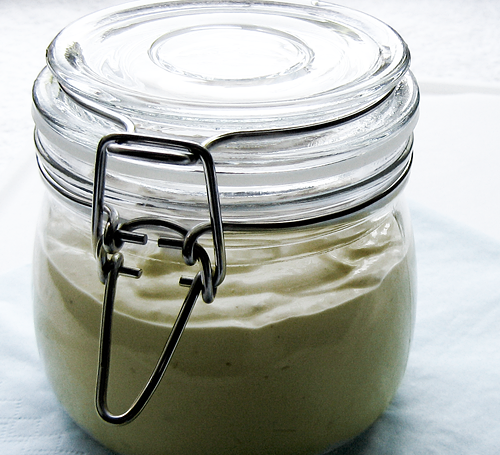 Homemade mayonnaise made with a quality oil, despite its fat content, isn't unhealthy. Egg yolks, oil, lemon juice and some cream or yoghurt - not that bad, no? My recipe is foolproof. I'll explain it here in all detail and I don't stop where mayonnaise making normally stops. And I'll tell you why. This will be quite lengthy now, but if you are a beginner to mayonnaise making, I really recommend reading this stuff. ► Most important: Use the freshest eggs you can get from a reputable resource. Store them all the way in your fridge. Store mayonnaise, aioli, salad cream, dishes made with it and leftovers always in the fridge and use it up within three days. Cold storage and fast consumption of dishes containing raw eggs is important to minimize the risk of salmonella infections. Especially in summer, if preparing for a larger crowd, don't put all food in one large bowl that will sit in the sun for hours. Instead, make smaller portions, keep them in the fridge all the time and put a new portion on the table or buffet not until the previous ones run low. Leftovers that sat in the warmth for some time should not be returned to the fridge. For safety reasons you better discard these. OK, back to the fun thing now. You'll need either a wire whisk or a hand held mixer or a food processor. The task is to slowly add oil in a small stream to some mixed egg yolks constantly while beating the mixture. It is most important to incorporate the oil fully before adding some more and this is even more important at the start. I always use a hand held mixer for this, constantly beating with one hand and slowly pouring the oil from the bottle with the other. I strongly recommend pouring the oil from a glass bottle. After I'd set up the second picture for this post I used this very cup to pour the oil from. I had no real control over the flow with this clumsy thing. And guess, what? It curdled!! Out of thousands ;-) of mayonnaise makings this was the second time, it curdled!! But this gave me another chance to check the handling of curdled mayo ;-) So again, pour the oil from something that really lets it flow in a very, very thin stream. Believe me, this is the most important part of mayonnaise making. Most recipes call for all ingredients to be at room temperature. For the oil, yes, this should be at room temperature. For the eggs, no, you don't need to let your eggs sit on the counter to warm up. The trick here is, after putting the egg yolks, the spices, mustard and lemon juice into the mixing bowl and before adding any oil, beat this mixture for around one to two minutes. This will incorporate air at room temperature and this is sufficient. I always do it this way. My fridge is very cold and I even store the mustard and lemons in it, whereas the oil bottle I keep on a kitchen shelf. The worst thing that can happen during mayonnaise making is that the mixture curdles. This may be due to adding the oil too fast (most often) or because the egg yolks were too cold (rarely). But that's not the end ;-) Just start it all over again, with a fresh batch of egg yolks and a very small amount of spices, lemon juice etc. and use the curdled mixture instead of fresh oil. You might well have to add a bit more oil at the end because overall you used more egg yolks. A mayonnaise made from the curdled stuff will neither look nor taste anything different than the normal one. The consistency of mayonnaise is determined by the ratio of egg yolks to oil. 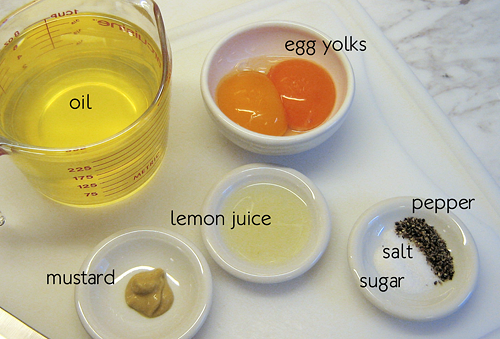 The more oil you beat into the egg yolk mixture the firmer the mayonnaise will become. Whatever you'll add later (sour cream, more lemon juice etc.) will soften the mixture again. Later in the fridge then it will solidify a bit. Actually you don't need to measure the oil. Depending on the consistency you want, while incorporating the oil you'll see when you have to stop. When seasoning the final mayonnaise, keep in mind that the intensity of spices will fade a bit when cooling in the fridge. BTW, I never serve my mayonnaise immediately after making it (which of course you could do). Having it in the fridge for at least an hour gives it the right consistency and taste. In a bowl mix all ingredients but the oil with a hand held mixer for one to two minutes. While mixing, start slowly adding some oil, about 1 teaspoon first. Incorporate well. Add a little bit more. Again, incorporate well. Go on adding the oil either by adding it in a very (!) thin stream constantly or by adding one small splash or tablespoon after another. Either way, always incorporate the oil completely before adding more. If in doubt, stop adding oil, beat the mixture well, then add some more oil. 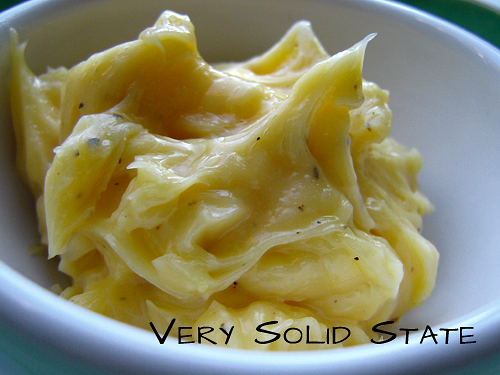 Stop adding oil as soon as you have a smooth, soft mixture that looks like a mayonnaise you'd like. Depending on the size of your egg yolks you either may not need the complete amount of oil or a little bit more. Season the mayonnaise to your taste and keep it in the fridge. Voilá - there you have your basic mayonnaise. 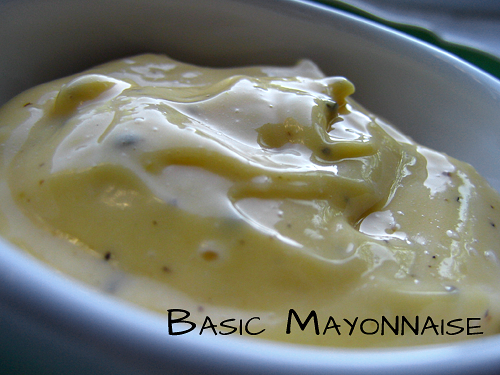 Start your basic mayonnaise as described above. When you come to the stage of the smooth, soft mixture, don't stop adding oil. Instead, add more oil in the same way as before until you have a very thick, solid mixture. This now looks like a mayonnaise you would never like to eat. Now add the sour cream, the lemon juice, some salt and pepper and mix very well. You'll see that the mixture is becoming smooth and soft again. Adjust the consistency to your liking by adding more or less sour cream and/ or lemon juice. This mayonnaise is somehow fluffier than the basic one and it is paler in colour. Keep it in the fridge. 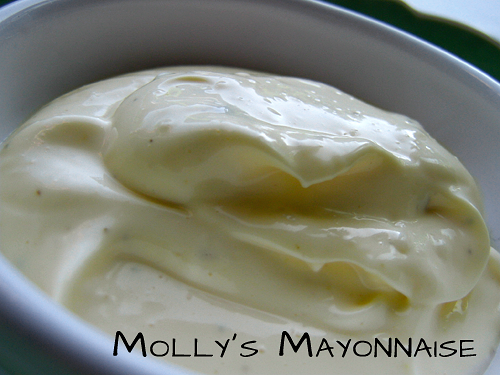 Make a basic mayonnaise as described, then go through to making Molly's mayonnaise (very solid state, then adding sour cream and more lemon juice) and then - at the end just add the finely crushed garlic. That's it. So easy. Yes, we call it aioli but it is far from the French or Spanish original. The original aioli consists of olive oil, garlic and bread crumbs although depending on the region, eggs or milk are added, too. And of course, for aioli you can use olive oil instead of neutral oil. However, my version is much sought-after at every barbeque I attend. And, sure enough, it is great with everything from the grill! 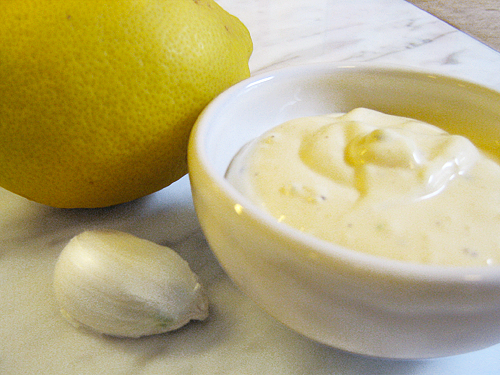 I'll give you a warning: when serving this aioli at a BBQ you better double the quantity. Some people eat it with a spoon. That's it. Making mayonnaise from scratch is neither difficult nor time consuming. I promise, after you've made your own for a few times, you'll never go back to the shop bought stuff. Most likely you'll have the ingredients on hand and with these you're just a few minutes away from a gorgeous, fresh mayonnaise. For easier comparison I've added the three important stages of mayonnaise making here again.